The Cloud Controller provides REST API endpoints for clients to access the system. The Cloud Controller maintains a database with tables for orgs, spaces, services, user roles, and more. 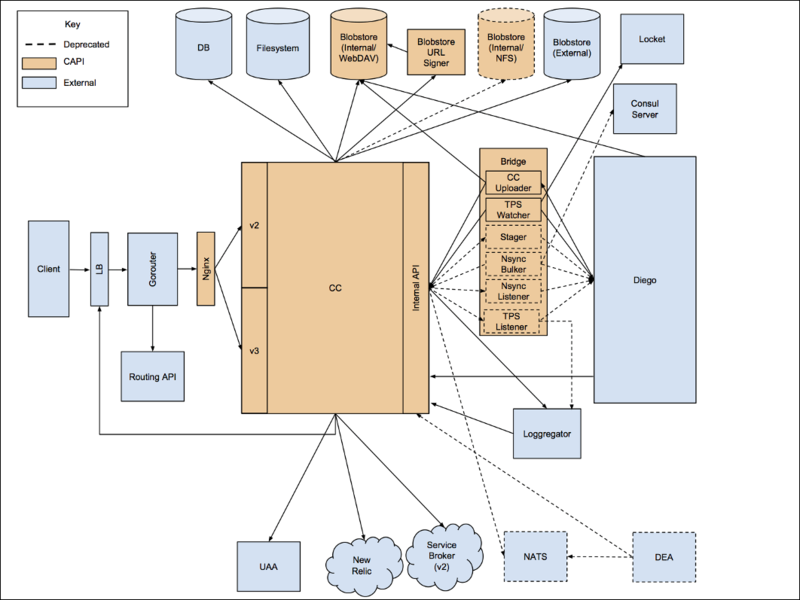 Refer to the following diagram for information about internal and external communications of the Cloud Controller. The Cloud Controller uses the Diego Auction to balance application processes over the cells in a Cloud Foundry installation. The Cloud Controller database has been tested with Postgres and MySQL. Cloud Foundry blobstores use the Fog Ruby gem to store blobs in services like Amazon S3, WebDAV, or the NFS filesystem. The file system location of an internal blobstore is /var/vcap/store/shared. A single blobstore typically stores all five types of blobs, but you can configure the Cloud Controller to use separate blobstores for each type. After a blob deletion fails silently or something else goes wrong, the blobstore may contain blobs that the Cloud Controller no longer needs or lists in its database. These are called orphan blobs, and they waste blobstore capacity. The Cloud Controller detects and removes orphan blobs by scanning part of the blobstore daily and checking for any blobs that its database does not account for. The process scans through the entire blobstore every week, and only removes blobs that show as orphans for three consecutive days. The Cloud Controller performs this automatic cleanup when the cloud_controller_worker job property cc.perform_blob_cleanup is set to true. The Cloud Controller does not track resource cache and buildpack cache blob types in its database, so it does not clean them up automatically as it does with app package, buildpack, and droplet type blobs. To clean up the buildpack cache, admin users can run cf curl -X DELETE /v2/blobstores/buildpack_cache. This empties the buildpack cache completely, which is a safe operation. Internal blobstore: Run bosh ssh to connect to the blobstore VM (NFS or WebDav) and rm * the contents of the /var/vcap/store/shared/cc-resources directory. External blobstore: Use the file store’s API to delete the contents of the resources bucket. Do not manually delete app package, buildpack, or droplet blobs from the blobstore. To free up resources from those locations, run cf delete-buildpack for buildpacks or cf delete for app packages and droplets. Travis currently runs two build jobs against Postgres and MySQL. For more information about how Cloud Foundry aggregates and streams logs and metrics, see the Overview of the Loggregator System topic.